Publisher's blurb: "PT-109 creeps through Pacific waters on a single engine, its murmur dissolving in the breeze. Lt. John F. Kennedy stands at the helm. A crewman cries out "Ship ahead at 2 o'clock! ", but the night blankets its true identity as it bears down on the plywood hull of the little PT. Seventeen years later, in 1960, Richard Nixon is elected president and the Time Corps wants to know what really happened to JFK in '43. 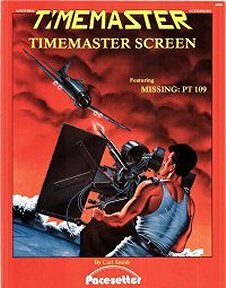 Self-standing screen features vital charts and tables for the TimeMaster game in one attractive, convenient place."